You have a new build house and a garden that you would like to transform. 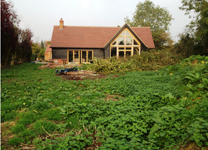 You would like to modernise your existing garden entirely or in sections. You have a desire to change your existing garden entirely. You would like to introduce a play area, vegetable garden, greenhouse area etc. 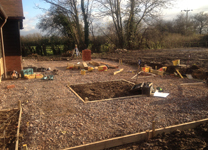 You would like to make the most of a new outdoor space after extending your property. You would like to extend the entertaining space of your garden. You would like to change the approach to the house and driveway access. You would like to submit plans to the local authority to meet planning conditions. You would like to maximise use of the space immediately around the house. Listen to what you are trying to achieve. Show you the various design options we provide and recommend the most productive process for your project. Discuss design fees for each stage and relate this to the designs in our portfolio. We will write back to you after the visit with a clear set of fees for the process that we have discussed. On your instruction we will then organise a convenient time to come and survey, take photos and start our work on your design project. 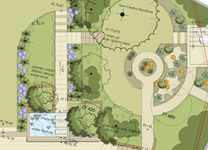 Design fees start at £1,440 for a concept plan. Each further stage is charged at £720 for a full day and £360 for a half day. A 10% discount off the design fee is applied to your design project as a result of this consultancy visit. In the event you choose to proceed to contract us through the build process of your garden design a further 10% discount will be available on the plants detailed on the planting design. The Garden Design consultancy fee is £75 if you live within a 15 mile radius of our office, additional fees apply outside this area. All costs outlined in this document include VAT.